Saturday, March 9 at 7:30pm. 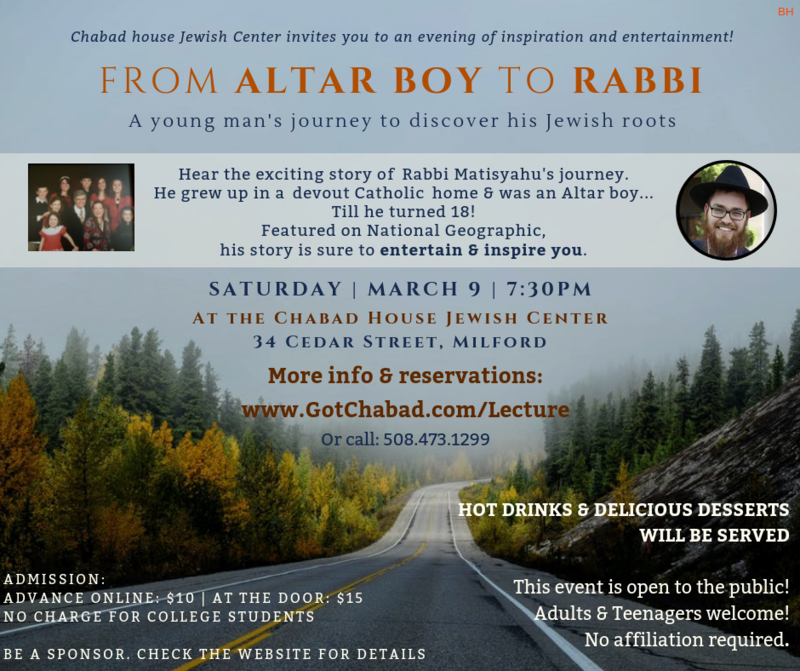 Rabbi Matisyahu Devlin grew up in devout Catholic Home, and lived the life of an Altar Boy till he turned 18. Hear his riveting & entertaining story. Delicious dessert and drinks will be served! Event is open to the public! Adults and teenagers welcome. No membership or affiliation required. Reserve by filling out the form below. This lecture has been made possible by donors including The Edwin S. Soforenko Foundation. Number of College Students attending* Thanks to a donor, college students are free of charge. Optional donation Amount Admission is subsidized, because of donors like you!